One of my first memories of going to the farmer’s market in Salem was finding a booth with a bucket of the gorgeous red-streaked cranberry beans above. I’d never seen anything quite like them, and I couldn’t resist bringing home a big bagful to play with—in fact, they were one of the very first foods I felt compelled to photograph. 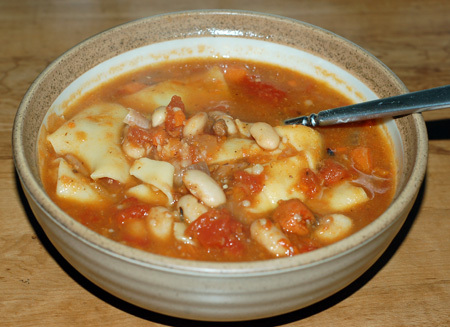 I used Marcella Hazan’s recipe for pasta e fagioli with homemade noodles, and ended up with a pot of deliciously savory soup, full of creamy, tender beans that lost all of that interesting coloration as they cooked. They had a better texture, hands-down, than any canned or dried bean I’ve ever eaten. 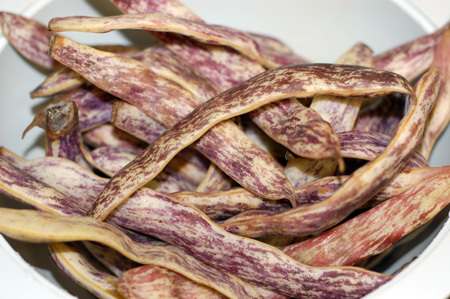 Ever since that meal, I’ve kept my eyes open for shelling beans whenever I go to the market. I’ve had good luck finding peas and favas in the spring, but late summer shell beans are a scarcity here for some reason. Four years later, I finally got my hands on some more fresh beans, not cranberry this time, but something the vendor called rattlesnake or dragon’s tongue beans. I raced back home and shelled them, to discover that they look an awful lot like purple pinto beans. Knowing that most of that color would soon vanish, I nevertheless whipped up a pot of pasta e fagioli. Here’s hoping it won’t be another four years before I get to make it again. *To cook dried beans: Put the beans in a bowl and add enough water to cover by at least 3 inches. Put the bowl in some out-of-the-way corner of your kitchen and leave it there overnight. When the beans have finished soaking, drain them, rinse them in fresh cold water, and put them in a pot that will accommodate the beans and enough water to cover them by at least 3 inches. Put a lid on the pot and turn on the heat to medium. When the water comes to a boil, adjust the heat so that it simmers steadily, but gently. 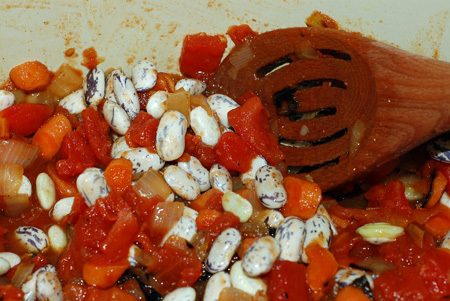 Cook the beans until tender, but not mushy, about 45 minutes to 1 hour. 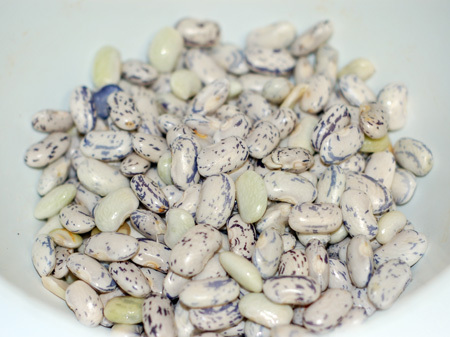 Add salt only when the beans are almost completely tender so that their skin does not dry and crack while cooking. Taste them periodically so you’ll know when they are done. Keep the beans in the liquid that you cooked them in until you are ready to use them. If necessary, they can be prepared a day or two ahead of time and stored, always in their liquid. For the soup: Put the olive oil and chopped onion in a soup pot and turn on the heat to medium. Cook the onion, stirring it, until it becomes colored a pale gold. Add the carrot and celery, stir once or twice to coat them well, then add the pork. Cook for about 10 minutes, turn the meat and the vegetables over from time to time with a wooden spoon. Add the cut-up tomatoes and their juice, adjust the heat so that the juice simmers very gently, and cook for 10 minutes. 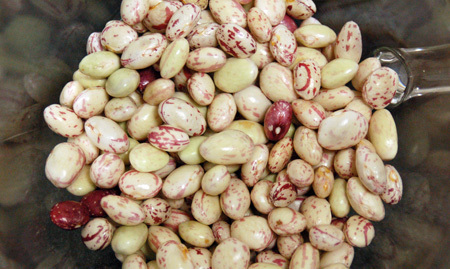 If using fresh beans: Shell them, rinse them in cold water, and put them in the soup pot. Stir 2 or 3 times to coat them well, then add the broth/stock. Cover the pot, adjust the heat so that the broth bubbles at a steady, but gentle boil, and cook for 45 minutes to 1 hour, until the beans are fully tender. If using cooked dried beans or canned: Extend the cooking time for the tomatoes in Step 3 to 20 minutes. Add the drained cooked or canned beans, stirring them thoroughly to coat them well. Cook for 5 minutes, then add the broth/stock, cover the pot, and bring the broth/stock to a gentle boil. Scoop up about 1/2 cup of the beans and mash them through a food mill back into the pot. Add salt, a few grindings of black pepper, and stir thoroughly. Check the soup for density: It should be liquid enough to cook the pasta in. If necessary, add more broth, or, if you are using diluted canned broth, more water. When the soup has come to a steady, moderate boil, add the pasta. If you are using homemade pasta, taste for doneness after 1 minute. If you are using macaroni pasta, it will take several minutes longer, but stop the cooking when the pasta is tender, but still firm to the bite. Before turning off the heat, swirl in 1 tablespoon of butter and the grated cheese. Pour the soup into a large serving bowl or into individual plates, and allow to settle for 10 minutes before serving. It tastes best when eaten warm, rather than piping hot. Variation with Rice: The same soup is delicious with rice. Substitute 1 cup of rice, preferably Italian Arborio rice, for the pasta. Follow all other steps as given above. Source: Essentials of Classic Italian Cooking , by Marcella Hazan.